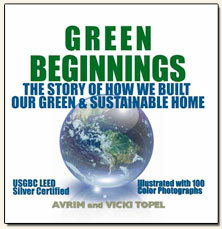 Green Beginnings is authors' Avrim and Vicki Topel's outreach initiative and reference site that provides information and education about green homes through our book GREEN BEGINNINGS THE STORY OF HOW WE BUILT OUR GREEN & SUSTAINABLE HOME, and our video THE GREEN BEGINNINGS VIDEO. We also offer EDUCATIONAL TOURS of the U.S. Green Building Council LEED Silver and Energy Star Qualified Home, which we planned, built, and now reside in, and continually updated content on our website. We use the USGBC LEED For Homes Green Building Rating System criteria as a benchmark when explaining the features and benefits associated with green homes. 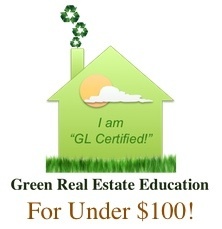 The U. S. Green Building Council is the nation's authoritative body providing governance and oversight for green and sustainable design and construction, and it's LEED (Leadership in Energy and Environmental Design) Green Building Rating System is the national benchmark for the design, construction and operations of high-perormance green buildings. 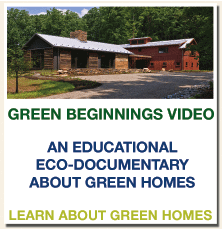 Our book, video, tours, and website support homeowners, students, educators, Realtors, contractors, architects, engineers, and building industry professionals by providing updated content and our experiential approach to learning and further understanding green homes and homebuilding. For persons with a real desire to visit and examine in detail a LEED Silver and Energy Star Qualified Home, we offer a limited number of 90 Minute Educational Tours for groups up to 5 persons by appointment only. See ONLINE STORE for pricing. For pricing and more information about our Tours, visit our ONLINE STORE. To inquire about scheduling a tour, please contact us and include your name, e-mail, phone number, tentative dates you would like to visit, and a brief explanation of why you wish to visit. Regularly scheduled tours are available Tuesdays and Wednesdays at 10 am and 1 pm by appointment only. See ONLINE STORE for pricing. Tours are also available Monday-Friday during daylight hours. 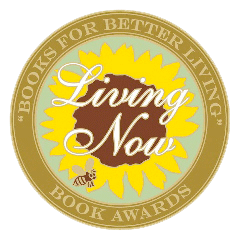 FOR EVERY BOOK YOU READ!